A registered dietician provides advice on how long to keep certain foods frozen. 4Patriots LLC emphasizes the need to also keep a significant amount of non-perishable food on hand for an emergency that could cause a blackout. Nashville, TN , United States - November 9, 2018 /MarketersMedia/ — Freezing food is a great way to make it last longer until one is ready to eat it. Freezing preserves the life of food, but some frozen foods will start to lose their taste sooner than others. In a recent news segment on WJLA-TV in Washington, D.C. registered dietician Allison Tepper discussed how long certain foods can maintain their flavor while frozen. In the two to three months category are cooked meats, soups, casseroles, rice and pasta. Cheese can stay tasty for six months, nuts and herbs for a year, and flour for two years. “That’s good information to have handy,” said Allen Baler, Partner at 4Patriots LLC. His company provides a variety of products, including survival food, that help people become more self-reliant and independent. And that’s what people get when they purchase 4Patriots Survival Food . Meals are offered in five different kits – 72-hour, one-week, one-month, three-month and one-year. The meals can be prepared in less than 20 minutes, and they require only boiling water. The food is contained in easy-to-store Mylar pouches, which keep out air, moisture and light. They are tucked inside tough, stackable totes that are discreet and store anywhere, including the basement, attic, garage, cabin or even an RV. “Of course, survival food is just one of the products we offer to help people prepare for an uncertain future,” Baler said. “Much more can be found in our latest 4Patriots Catalog. “In addition to a wide variety of survival food for breakfast, lunch, dinner and dessert, we offer solar-powered generators, a water purifier system for your home and on the go, a power hub for your car battery, health-related products, and even a military-grade EMP bag. 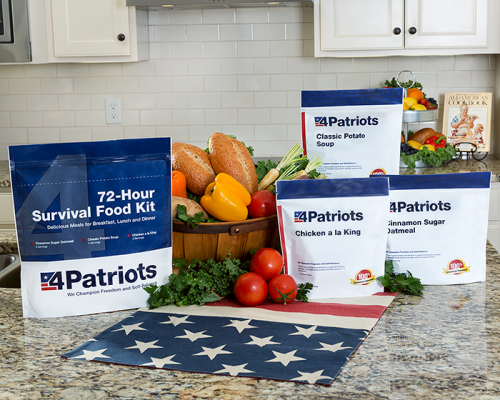 4Patriots provides emergency food products that are shelf-stable for 25 years. 4Patriots Survival Food kits are made with food grown, harvested and packaged in the United States, and all of the meals are made without any genetically-modified products, preservatives or fillers. The kits are available in 72-hour, one-week, four-week, three-month and one-year supplies.